To add salt to injury, it is always at the worst possible time like when you in the middle of a major work presentation. Luckily, it is possible to replace a dead computer power supply on your own. Here are some simple steps to fix this problem. You begin by unplugging the cord from the back of the computer power supply, and then remove the lid casing. There is a label on the power supply that notifies you of the brand and model number. Note this down and order an identical replacement as well. One needs to obtain a replacement for the dead power supply. Although these things are interchangeable to a point it is wise to choosing an identical replacement. That way you can be absolutely sure it will fit the available space and come with all the necessary power leads. Removing a power supply from a PC requires you to disconnect its leads from several places. Therefore, before you pull any plug take snapshots using a digital camera of the case interior, including one of each lead's locations causes once your PC is torn apart, you will definitely have a hard time remembering where everything is supposed to be. Disconnect all the power leads. You may not be able to reach all the power leads without disassembling parts of the case. While doing this, don't forget to classify the screws together with the ones related to them. After disconncting all the leads, check out the rear of the case and find the three or four screws holding the power supply in place. Remove them, then carefuly lift out the Power Supply, making sure that the cabling does ont get tangled on any other component around it, accidentally pulling it loose. 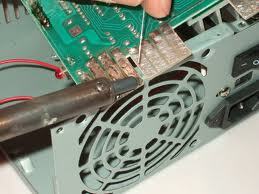 Install the new power supply, making sure the replacement power supply is set to the correct voltage, which means 115. If you are not sure, look for the little red switch on the back. If it's showing 230, slide it to 115. Makes sure everything works before you close it up. Connect it to the power supply and plug in the monitor and keyboard. It should come to life unless the motherboard and main leads are not properly connected.